On July 19th 1900 the first line of the Paris métro was opened (almost three decades after the first line of the London Underground), and from the '20 on an extensive network would unite most of Paris and Parisians with each other. Millions and millions travelled everyday, leaving no trace, except for the occasional ticket left at the exit. And while the world above saw many changes – Le Corbusier, the second World War, Brigitte Bardot – underground everything stayed pretty much the same. Maybe the biggest change was in 1973, when human ticket punchers, the 'poinçonneurs' at the entrance were replaced by automatic turnstiles, operated by the new metro ticket with a magnetic strip. 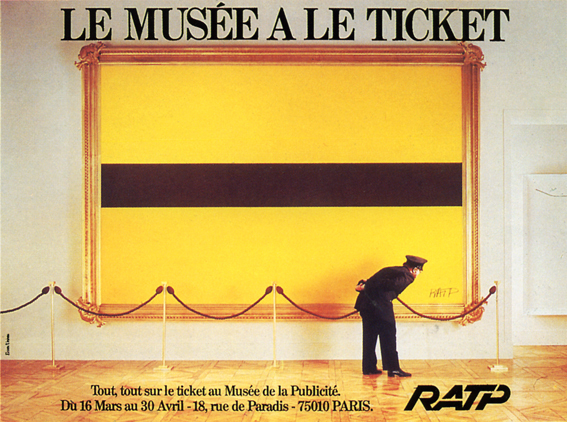 This ticket, yellow, with a brown band in the middle, would become the iconic image for the metro, as can be seen in some publicity campains that eventually made it to the museum (of publicity). Then, after nearly two decades, the company that operates the metro (the RATP), decided to change the color of the ticket changed to jade (a kind of green) as part of a new visual identity. 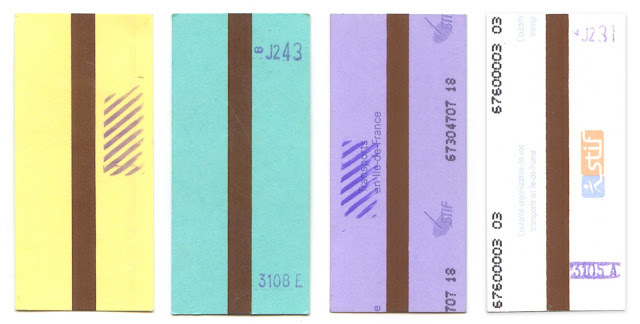 Most of these details are to be found in a very informative book with the title Petit histoire du ticket de métro parisien by Gregoire Thonnat, but even this expert on the subject doesn't tell why the ticket color changed again to an (equally nice) purple 11 year later, only lose nearly all color in 2007. This last version of the metro ticket is used for someshirt1202, with some reinforcement of the sparse presence of the colour orange by adding a few weekly tickets.